An under-strength Indian side felt the absence of Bhuvneshwar Kumar and Jasprit Bumrah dearly as the bowlers crumbled in the face of Kusal Perera’s merciless onslaught. Earlier, India had managed to pose a target of 175, courtesy of Shikhar Dhawan’s blazing 90-run knock, after a top-order collapse. Brief Scores : India 174/5 (Shikhar Dhawan 90, Manish Pandey 37; Dushmantha Chameera 2/33, Danushka Gunathilaka 1/16) lost to Sri Lanka 175/5 (Kusal Perera 66, Thisara Perera 22; Washington Sundar 2/28, Yuzvendra Chahal 2/37) by 5 wickets. Rohit Sharma had a nightmarish start to the tri-series as a captain as he fell prey to Dushmantha Chameera’s slower ball in just the fifth ball of the first over, reducing India to 2/1 at the end of the first over. Raina stepped in next, and although Dhawan tried going for the big shots, he wasn’t able to connect the ball well. With India’s attempt to replicate their heroics in the powerplay overs from South Africa failing, Raina’ attempt to shuffle around the crease met an early end as India were reduced to 9/2 at the end of the second over. Dhawan and Pandey took the safer route thereafter as they kept rotating the strike with occasional boundaries. With Dhawan taking on the role of the occasional aggressor, India finished the powerplay at 40/2 and reached the halfway line at 80/2 with the southpaw approaching his fifty. Dhawan brought up his fifth T20I fifty in the next over, which seemed to signal a change in gears. The urgency to up the ante was clearly seen as both the batsmen were seen flashing the blade at everything. And after Thisara Perera was hit for two boundaries in the 12th over, India’s adventurous approach cost them again, as Pandey lost his wicket in the 13th over. With overs depleting, India had no other choice but to go at everything and both Dhawan and Rishabh Pant went for maximums in the 15th over as India reached 124/3. Dhawan continued the onslaught, hitting three sixes in the next two overs. However, with two overs to go, the southpaw eventually fell to Perera’s delivery, reducing India to 153/4 in the 18th over. With the track evidently helping the bowlers, Dinesh Karthik and Pant knew 170 would be competitive and they went for it in the penultimate over. India snatched 14 runs, including three boundaries, as they ended the innings at 174/5. India’s primary target was to limit the hosts to as less as possible in the powerplay and they failed terribly in that task. Jaydev Unadkat started the second innings on a positive note as he restricted Sri Lanka to just six runs in the first over. But, it was the wicket of Kusal Mendis on the third ball of the second over that made the difference, as Kusal Perera came in next. After sending Sundar for a six on his second ball, the explosive batsman decided to take on first change, Shardul Thakur, and the hapless pacer was whallopped for a whopping 27 runs in the next over as Sri Lanka reached 46/1 in just three overs. Though Unadkat scalped Danushka’s wicket in the fifth over, it was not before a 50-run third-wicket stand as Sri Lanka garnered a mammoth 75 runs in the first six overs. Yuzvendra Chahal and Vijay Shankar more economical, but could only do so much as Perra brought on his fifty in just 22 balls. Chandimal was soon sent back to the pavilion by Chahal in the ninth over, but Sri Lanka were cruising at 101/3 on the halfway line with Upul Tharanga alongside Perera. 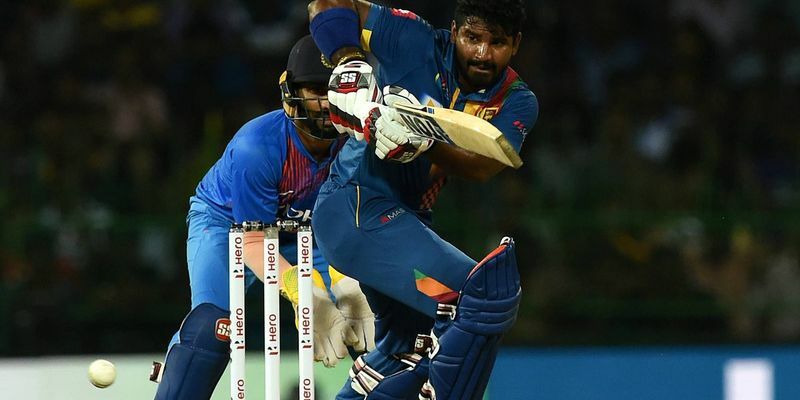 Tharanga and Perera refused to lift their feet off the pedal as Sri Lanka continued their explosive hitting with two sixes and boundary in the next two overs. India were looking at defeat with just 49 runs needed in eight overs, when Perera was bamboozled by Sundar’s turn, reducing the hosts to 127/4. It was the much-needed wicket for the visitors and suddenly, a glimmer of hope was seen at the far end with Chahal and Thakur willing to take their chances against the likes of Dasun Shanaka and Tharanga. The spike in dot balls increased soon and Tharanga crumbled under pressure as he missed Chahal’s delivery completely to see it dismantle his stumps. Thakur recovered some of his confidence as he conceded just eight runs from his second and third overs while limiting the hosts to 140/5 in 16 overs. With 35 needed from the last four overs India still had a good chance of making a comeback into the game. However, it was not to happen as Vijay Shankar, Unadkat and Thakur’s next consecutive three overs proved costly enough. Shankar and Unadkat’s next overs went for 11 & 16, leaving Thakur just 8 runs to defend in the 19th, and the Lions duly brought the proceedings to end with a boundary, handing the visitors an opening day loss in the Emerald Isle.